Here's a selection of the best New Year's Eve events and entertainment opportunities for 2019: gala dinners, theatre events and live music will make you fall in love with the city's atmosphere. Celebrations will start on 31st December 2018, will you join local party-seekers? 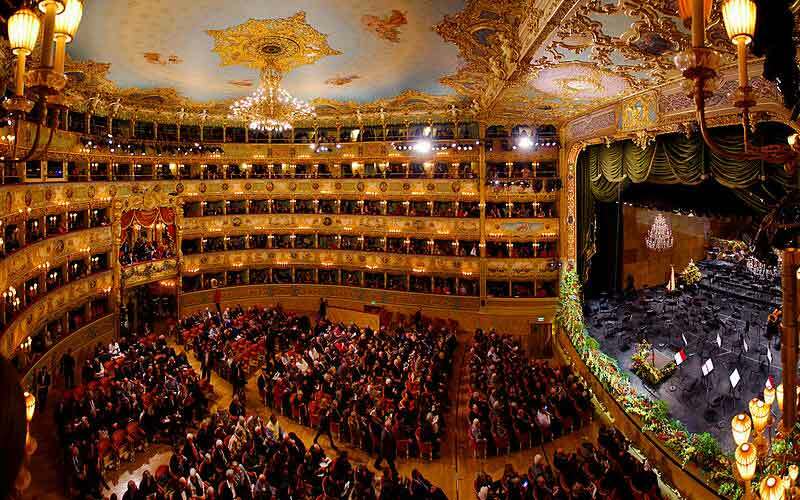 Conducted by Myung-whun Chung and featuring the participation of the orchestra and choir of La Fenice, this traditional not-to-be-missed event is divided into two phases, the first fully dedicated to opera and the second ending with the propitious ‘Va Pensiero’ from Giuseppe Verdi’s Nabucco and with a toast on the notes of ‘Libiam ne’ Lieti Calici’ from the renowned Traviata. Time: on 29 December at 8pm, on 30 December at 5pm, on 31 December at 4pm and on 1 January at 11.15am. 18th century costumed orchestra I Musici Veneziani will ring in the New Year with an exceptional event: a classical concert performed by a larger ensemble (14 musicians), featuring renowned Soprano Vittoria Boldrin, Tenor Massimo Cagnin and Baritone Nico Mamone. The program includes several of the most celebrated, evocative pieces by Mozart, Strauss, Verdi, Pergolesi, Cimarosa as well as other celebrated musicians. Riviera del Brenta offers an exclusive San Silvestro dinner aboard of a comfortable boat, to live the festive spirit while admiring the beauties of the lagoon. The programme includes a vast fish menu from appetizers to dessert seved in a candle lit ambience and a slow tour starting from Riva delle zattere and reaching the Lido of venice after a stop at Saint Mark’s Basin. Guests can also participate to the LOVE 2018 event, held in Saint Mark’s Square and celebrating the power of love as wish for a propitious 2019, followed by fireworks. Hotel Danieli offers a vast array of dinner options for 31 December. Guests can take advantage of a tasting menu at Danieli Bistro, featuring a selection of cicchetti – small typical appetizers – accompanied by Ruinart bubbles. Starting from 6.30pm, at the top floor of the hotel. (Please note that seats are limited. Reservations available until seats last). The hotel also features a cocktail party held in the lounge featuring a party with cocktails, culinary delights, DJ set, and live entertainment starting at 9pm, or even an exclusive gala dinner served at the panoramic Terrazza Danieli. The menu features a selection of favourites from the festive season, accompanied by music and by Krug champagne, both during the dinner and for the toast to welcome the new year. Service starting at 8pm. Bauer Palazzo offers different options to pamper its guests on New Year’s Eve. Those in search of a less formal, yeut fun-packed option can take advantage of the buffet dinner served at the hotel’s Sala Cesetti. Service starting at 8.50pm. Guests wishing to savour some of the festive favourites can reserve a seat for the gala dinner, served at Restaurant De Pisis and preceded by a welcome aperitivo within the Salone delle Feste. Service starting at 8pm. Both options are accompanied by an accurate wine selection and followed by access to the terrace to enjoy the fireworks, a midnight toast and the propitious lentils and cotechino. Guests can also enjoy a full night of dances on the notes of the dedicated Dj set at the BBar. Enjoy the festive atmosphere with an exclusive dinner at Le Maschere restaurant, within Starhotels Splendid Venice, with a tasty fish menu accompanied with white wine and a live orchestra. Dinner is followed by a propitious toast with cotechino and lentils, as well as pasta with beans. From 11pm, guests can also book a table at the hotel’s Altana terrace to enjoy Midnight’s fireworks enhanced by finger food and champagne. Maximum 4 people per table. The couple whose Midnight kiss will be the longest will be gifted with a free dinner. Elegant dress code required. More events are yet to be announced, save this page among your favourites! Journalist based in Northern Italy, passionate traveller, photography lover and unstoppable curious of the world. Giulia works for Where Italia to share her passions and to promote the most unmissable events and lifestyle experiences to make Where readers' trips a one-of-a-kind discovery.